Imogen's Typewriter. 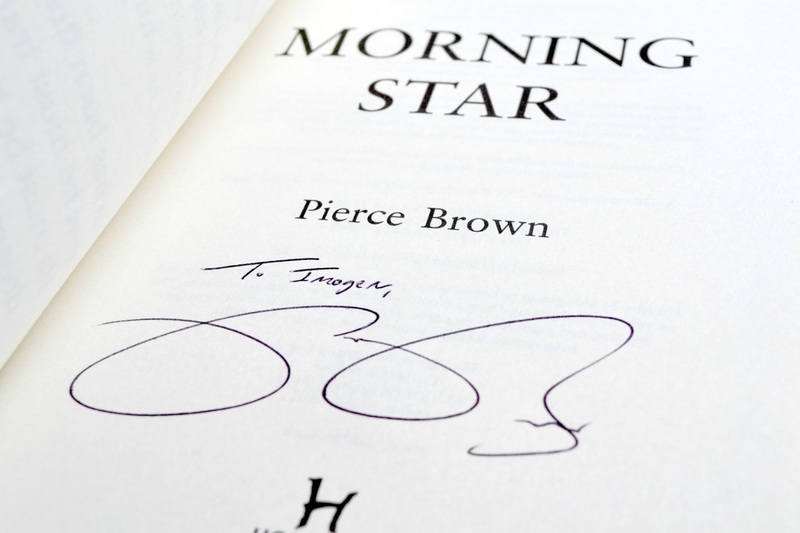 : Book Review: Morning Star by Pierce Brown! Book Review: Morning Star by Pierce Brown! So it ends. The final book in the Red Rising trilogy is officially out. This review will contain spoilers for the first two books so if you haven't read those yet then you may want to check out my reviews for Red Rising and Golden Son! 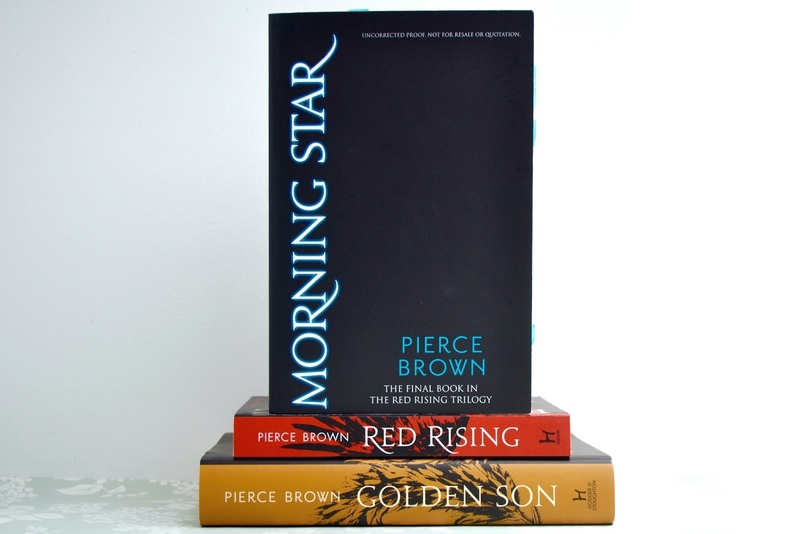 In preparation for meeting Pierce Brown at the Hachette headquarters in London I decided to re-read the trilogy from the beginning and ended up having about twenty-four hours in the end to get through Morning Star. I read it on the train, I read it in a taxi, I read it in my hotel and ended up being 30 pages from the end when the event rolled around. Avoiding spoilers in a room full of Howlers? Not easy! But a lot of fun and thank you to Hodder and Stoughton for the invite. Despite the serious topic of the book, and the severity of the final challenges that Darrow faces, Pierce Brown keeps a little comedy with Sevro. As a character he grows up a lot in the time between books, especially after Golden Son's cliffhanger but somehow remains that friend in the group that can make a joke even at the darkest times. He and Victra remain my favourites. Team Sevro! I have to mention the "Bye Felicia" add on like everyone else whenever the book comes up. It was probably pretty funny at the time of writing, made me smirk when I read it, but will age like milk. Call me a snob but I like my Sci-fi without meme references. Give me more Sevro losing his candy bar any day. At the end of the book I had a few main issues that had me frowning at the back cover for a good twenty minutes while I sorted my thoughts; When writing in first person, it's hard to surprise the reader about something that the main character has planned without it feeling deceiving to the reader. I felt deceived. It's an issue whenever this point of view is used but I've read other books that have toed the line between planning the whole thing out for the reader, and lying to them a bit better. Pacing was difficult. These books have been published really quickly and after three novels Pierce Brown is not a world in a grain of sand kind of writer, it was a time-consuming read. This is a 500+ page book where a lot happens, some of it could have been trimmed down but also, this could have been split into two books and certain characters like the Jackal wouldn't have fallen by the wayside. Sometimes it felt over-complicated trying to fit so much in but the story gets a satisfying conclusion and this isn't one of those 'last book in a series' where story is forgone in favour of tying everything up. It's a novel in its own right and leaves just enough open for the new trilogy announced; Iron Golds. And to end the review, I'm a fan of happy endings, but the way Morning Star ended was- cheesy. There were other ways it could have gone down, I think. Too much ended well for a book that was about battles on all sides of the war. But I liked the ending to Lost so take my opinion with a pinch of salt. Overall, despite my issues, this was a solid ending to the trilogy and has promise for the three more books in the new 'Iron Gold' series. But I ponder on if I will continue with that trilogy, which I'll go into more in my series review. Want a copy? You can get one here! Have you read Morning Star? What did you think? 5 Things I Love about Amazon Instant Video! 5 Things I Love about Lent! Books I 'Paused' in 2015! 5 Things I Love about The Walking Dead! Beauty: Lush Oxford Street Exclusives Haul! 5 Things I Always Forget to Do! 5 Things to Help a Migraine!